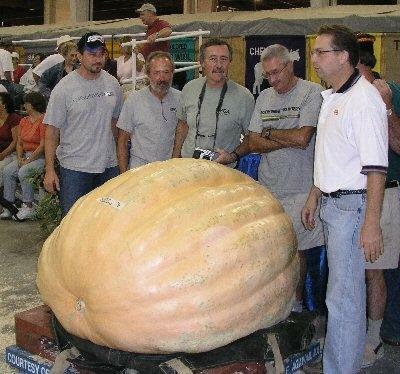 Joe Jutras from Rhode Island successfully defended his Big-E Champion title by finishing in first place with a 946.5 pound pumpkin (grown on the 805 Pukos). In fact the state of Rhode Island made a HUGE statement by taking the top three spots - all with pumpkins over 900 pounds! Fred Macari took second with a 941.5 pounder grown on the 1058 Houghton. Steven Sperry took third with a 904.5 grown on the 1225 Jutras. These RI boys are coming on strong in 2004!